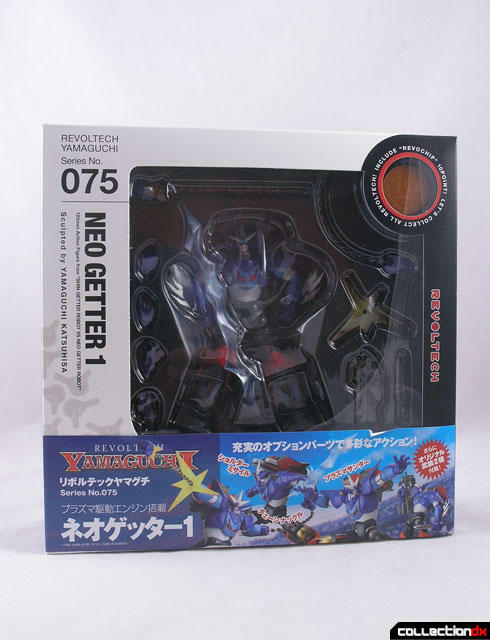 Neo Getter Robo comes from an alternate universe, different than the one that the Revoltech Getter Dragon comes from. It's an entirely different series from Getter Robo: Armageddon. 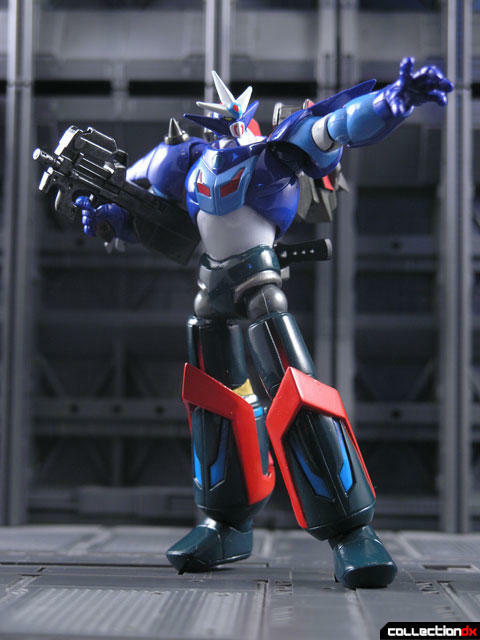 The toy comes from the series Shin Getter Robo vs. Neo Getter Robo, a four-disc Japanese OVA from 2000. 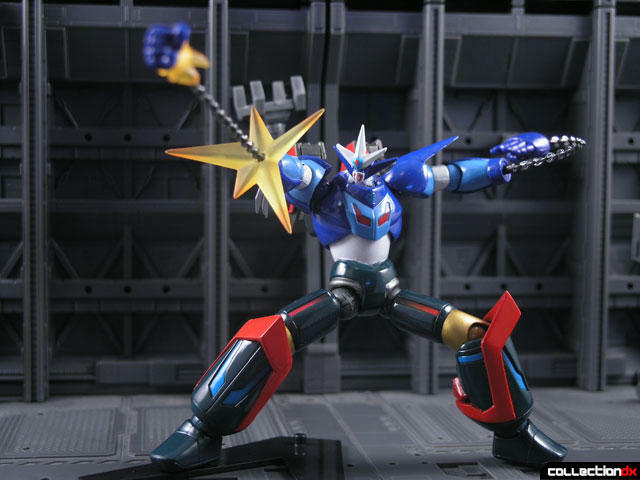 Personally I am a big fan of the Neo Getter designs. 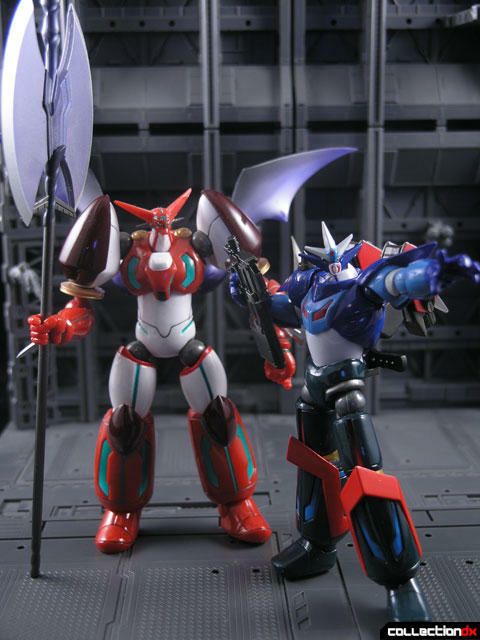 They seem right at home with the classic Getter aesthetic. I only wish we would get designs of Neo Getter 2 and 3. 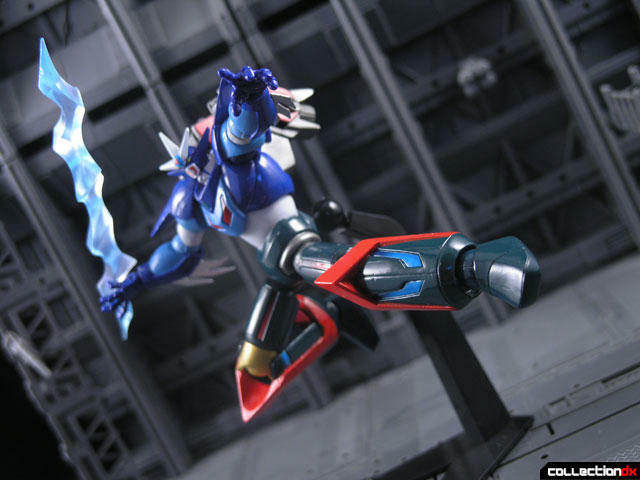 And while we are on the subject, where the hell is my Texas Mac Revoltech? 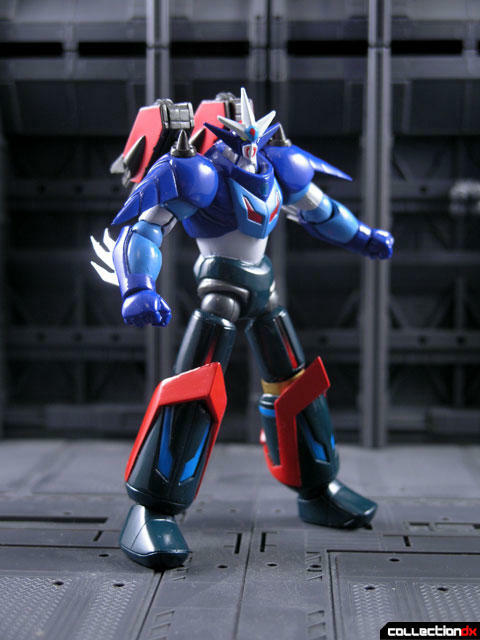 Neo Getter 1 Revoltech arrives courtesy of HobbyLink Japan. So the toy is cool, as you would expect, and there are a few neat things they have done with it. 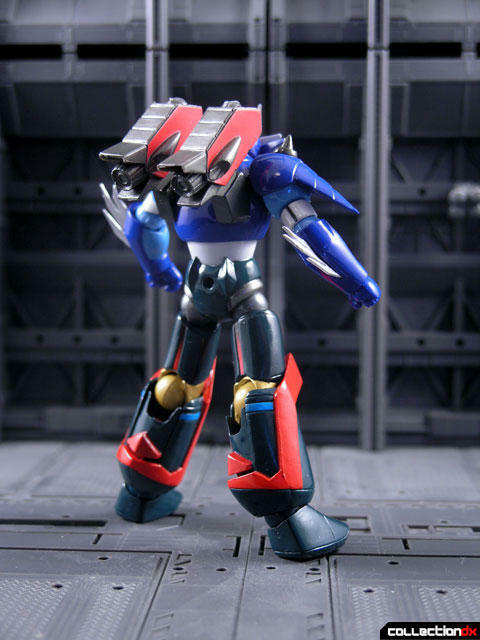 The back of the legs have collapsable panels that enables Neo Getter 1 to achieve more dynamic poses. 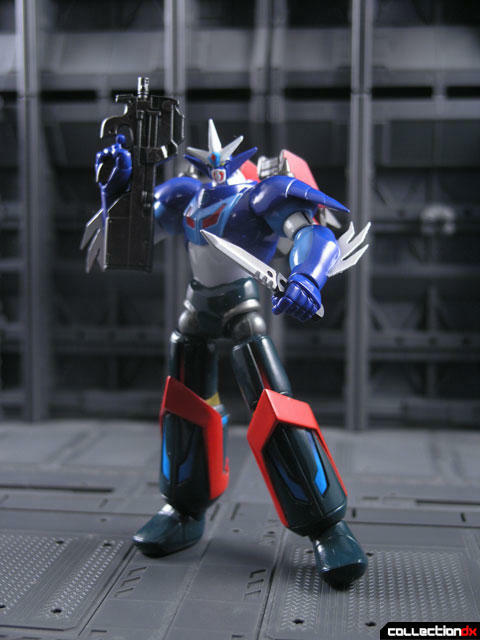 The included option hands are the standard fare - gun holding hands and open hands. The open hands have hinged wrists. The hands can be swapped out with Chain Knuckles - Long chains attached to fired fists. The chains are fixed pose, so you are stuck in they pose they are in. To add to the effect they have added a yellow burst effect that is placed on the arm to make it look like it is firing. 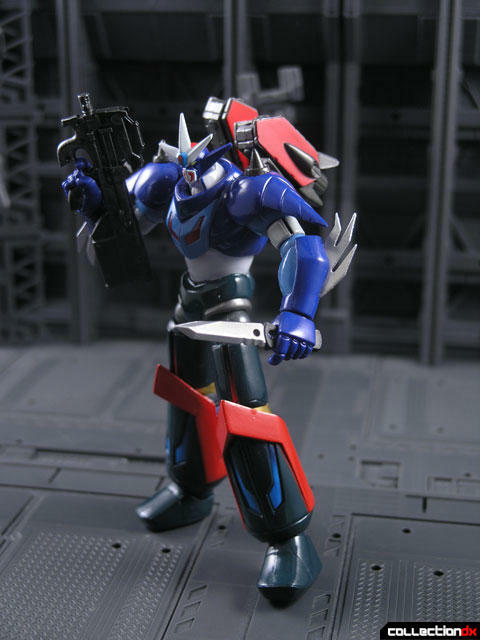 The optional hands can hold either a gun or a knife, and the knife can be stored in a special holder that attaches to the back. Unfortunately, the right holding hand sits loosely in the arm and has a tendency to fall out, something I have never experienced in a Revoltech before. 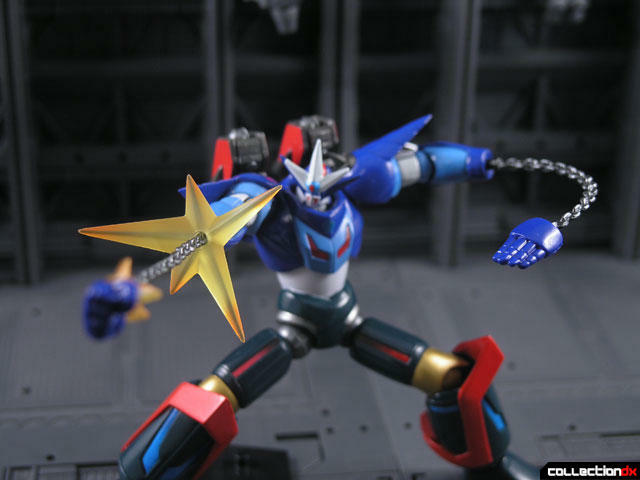 The Plasma Thunder effect is a large translucent blue energy bolt that attaches to one of the open hands. The part has a peg that fits firmly into the palm of the hand. Probably the coolest accessory is with the shoulder missile launchers. 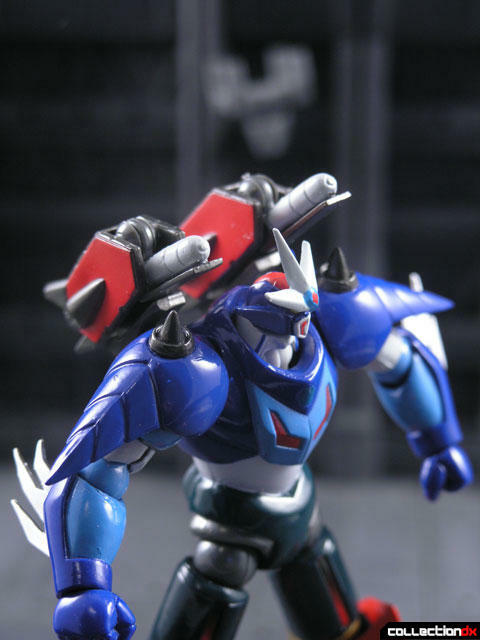 The launchers attach to the back of the figure and can actually open up. 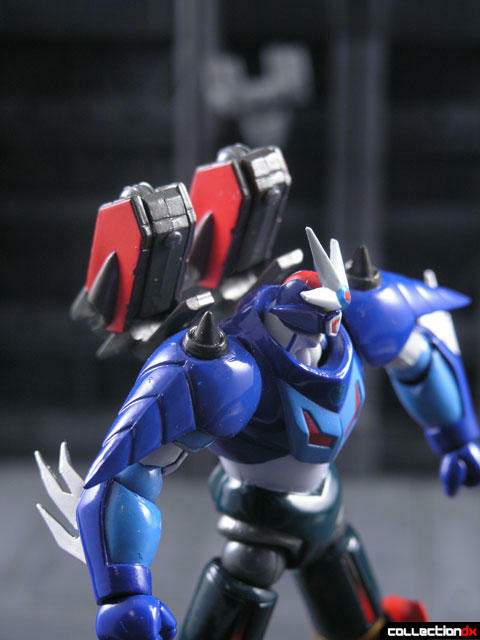 Using a small Revoltech joint as a hinge, you lift the top up and then swing out and rotate a concealed missile. All of this of course comes with the standard Revoltech stand, coin and container. Another quality Revoltech release, available from HobbyLink Japan. Thanks for the review Josh. 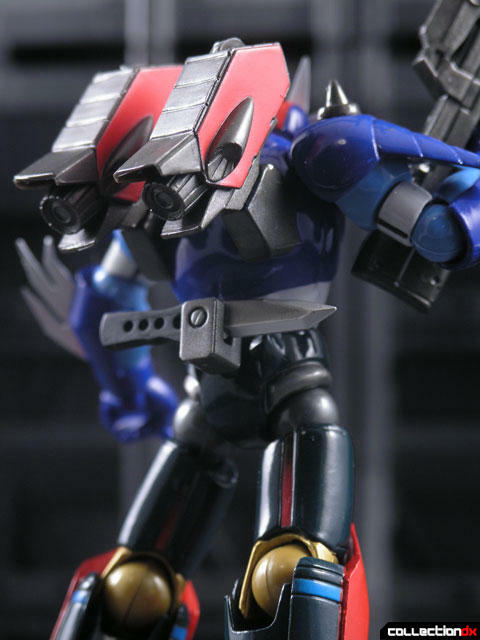 One thing is for sure, no matter how much I like my Aoshima Chogokin Neo Getter 1, it sure doesn't have a chance in hell of achieving those poses!! Very cool indeed. "Ooh- I like him! Yes...!" Never seen that Getter before... Is it also a triple changer? 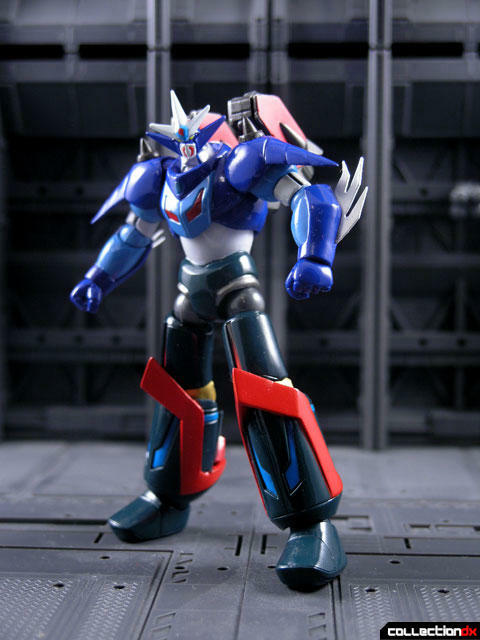 Well, I already have Revoltech Getter Robo 3, so I may as as well try to get this one just based on looks. Very cool toy. Most probably Kaiyodo's Revoltech will open widely the door for a new branch of Soul of Chogokin. 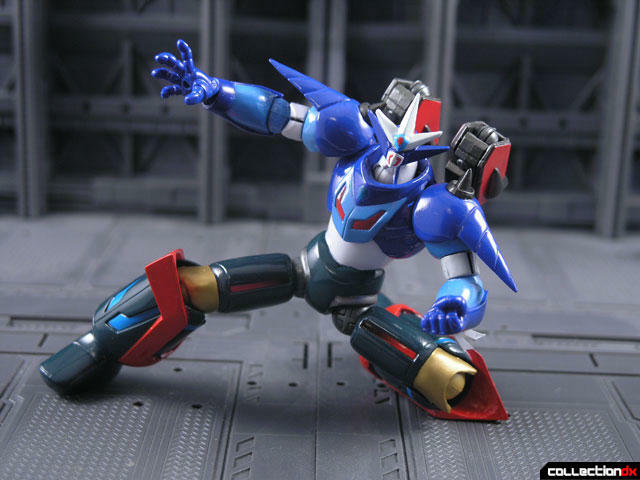 We have already seen this with Bandai's Shin Mazinger Z and I'm sure the new chogokins will have much more posability. Kaiyodo is simply giving us what we want - extremy cool toys at affordable prices. I have always loved Kaiyodo and HobbyLink Japan. Domo arigatoo gozaimas. Thank you Josh for the wonderful review. "And while we are on the subject, where the hell is my Texas Mac Revoltech?"